The state of Minnesota has honored a longtime member of The College of St. Scholastica faculty for her distinguished service in the healthcare education field. Martha (Marty) Witrak, dean of St. Scholastica's School of Nursing, was recently the recipient of two awards from the Minnesota e-Health Initiative during the group's 10th Anniversary Recognition Luncheon Program. The Minnesota e-Health Initiative is the Minnesota Department of Health's information technology division. E-health is the use of information technology and electronic health record systems to improve patient care, safety and costs. Witrak received the Leadership and Impact Award and the Co-Chair Service Award. "She is a strong leader for e-health and moving the state forward in its goal for adoption and effective use of electronic health records," said Bob Johnson, project manager in the state Office of Health Information Technology|Health Policy Division. 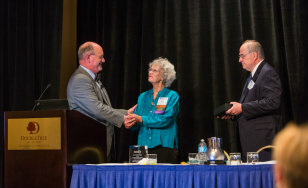 "She was effectively able to represent the academic and nursing community." As co-chair of the Minnesota e-health advisory committee, Johnson said, Witrak was a skilled leader and consensus builder among a large group of professionals with widely varying interests. "Her can-do attitude really helped to bring people together," Johnson said. Witrak's four-year term on the committee ended in June.